Simon & Schuster, 9781416588719, 208pp. I have nothing against snakes, provided that they’re hundreds of miles away from me. And I have nothing against my dad, given the same set of conditions. 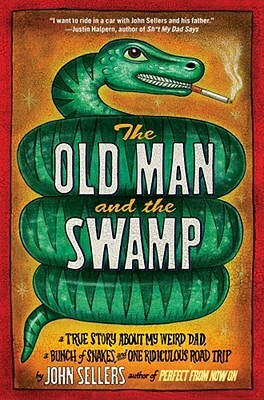 In a fit of questionable judgment, consummate indoorsman John Sellers tags along on a journey to search for snakes with his eccentric, aging father—an obsessive fan of Bob Dylan, a giver of terrible gifts, a drinker of boxed wine, a minister- turned-heretic, and, most importantly, the self-designated guardian of the threatened copperbelly water snake. The quest is their fumbling attempt to reconnect. Decades of bitterness, substance abuse, acrimonious divorce, and divergent opinions about personal hygiene have conspired to make the two estranged. Sellers has just begun to develop a new appreciation for the American wilderness, and all the slithering creatures that populate it, when his father’s deteriorating health thwarts their mission and disturbs their tentative peace. Determined to finish what they started, he ventures back into the swamp— alone, but more connected to his dad than ever. With big-hearted humor and irreverence, The Old Man and the Swamp tells the story of a father who always lived on his own terms and the son who struggled to make sense of it all.